I'm bored. There's nothing to do. It's too hot! I'm tired of playing outside, what can I do inside? It's raining out, there's NOTHING to do! These are common phrases parents hear when the fun runs out and they turn to their cruise director for guidance. In instances where you don't have a camp or play date lined up, you'll need something to keep them busy AND happy. In the past, I've turned to ideas from Pinterest and I've taken out old art lesson plans to engage them in a project that will keep them busy. I've even turned to duct tape and cardboard to build superhero and Star Wars creations of my own. Turns out, I am not the only dad. Crafteeo kits were created by a San Diego dad who resorted to crafting to disengage his son from electronics. Though a lot of parents have the same approach, there are very few craft projects out there that are thoroughly engaging and challenging to both the parent and the child! Wanting to engage his son in more creative play, How-Lun Chen started up-cycling left over cardboard boxes and created incredible designs of armor pieces which include Sword, Helmets, Shields, and body armor. 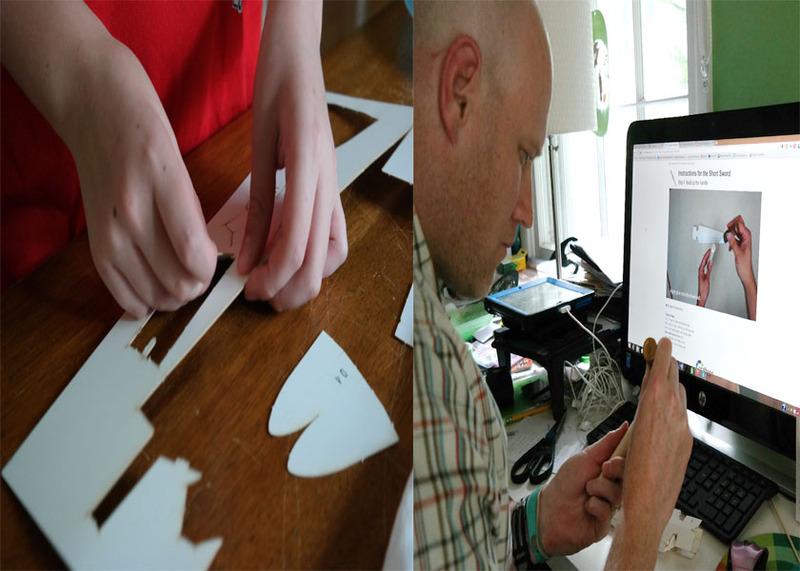 He eventually turned these designs into craft project kits so that other parents could share the building experience with their children. How-Lun created Crafteeo a year ago and his kits have amazed people at the craft trade shows that he has participated in and everything is made here in the U.S. in San Diego. My son and I spent a day building the short sword that they sent in a mailer to my house. The kit comes pre-punched with all the necessary pieces to build the creations in the envelope. All kits except for the short sword come with the paint necessary to finish them but the assembly products being paper means you can decorate them as you see fit. Instructions in the form of a video on how to build them are located online and are easy to follow. We worked together as a team to build their short sword craft and were amazed at the results! All it takes from you is the dedication and commitment to do it together. Don't have the funds to back the campaign? No problem! You can enter to win your own 3 Pack Build Kit below. 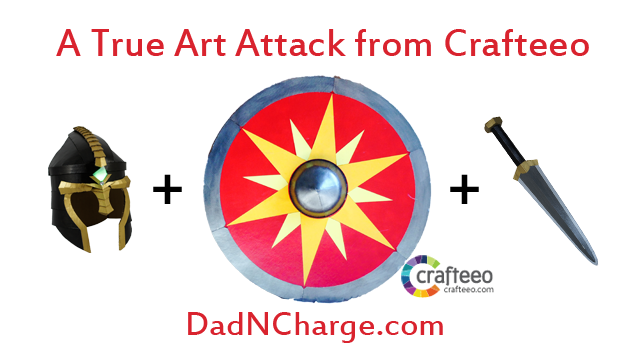 Crafteeo is offering a Helmet (fits heads up to 22 inch circumference, about 7 year old), a shield and a short sword, Use the Rafflecopter entry below to enter. You can earn more entries by Tweeting about their Kickstarter once a day.Be sure to follow Crafteeo, by joining their email list so you can be aware of new projects that come up and happy crafting! FTC Disclaimer : I received compensation in the form of building kits from Crafteeo in exchange for the review of their product. All opinions expressed are my own. You should really enter because these kits are cool!